Along the Antrim Coast is the world-renowned Giant's Causeway. A UNESCO World Heritage Site, the Giant's Causeway is considered the Eighth Wonder of the World. The Antrim Coast in the north of Northern Ireland, is one of the most scenic coastlines in Britain and Ireland, with breathtaking landscapes, the Carrick-a-Rede Rope Bridge, and the dramatic cliff-side ruins of Dunluce Castle. The Titanic Memorial, located on the east grounds of Belfast City Hall, honors those who died in the RMS Titanic disaster, and includes a list of all those who perished on April 15, 1912. The Botanic Gardens reflect Belfast's Victorian heritage, boasting two notable period buildings, a children's playground, a bowling green, a rose garden and assorted tropical plants and trees. The town of Downpatrick in County Down, Northern Ireland has a strong connection to St. Patrick. It is here that St. Patrick began the conversion of Ireland and built his first church. 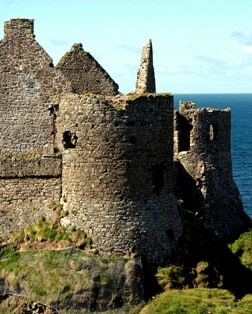 Considered the first real Irish Castle, Carrickfergus was built in 1180 by the Norman John de Courcy to guard the approach to Belfast.